Whether you're caring for a 500-pound African lion or a cuddly 10-pound tabby, many of the elements of essential cat care remain the same. With that in mind, the Oregon Zoo is partnering with Banfield Pet Hosptal to expand its popular lion-keeper talks this month, presenting information about enrichment and preventive care for cats big and small. Big Cat Care, presented by Banfield, launched March 31 at the Oregon Zoo and is free with zoo admission. On the Big Cat Care stage, visitors can see firsthand how zoo experts keep lions active and engaged and train them to participate in their own preventive care. Keepers will also share information about how guests can provide preventive care and enrichment for their domestic cat companions. "We're excited to share our Big Cat Care training and enrichment tips with visitors, and we hope they apply them to their little cats at home," says Becca Van Beek, who oversees the zoo's African section. The Big Cat Care program is part of a larger partnership between the zoo and Banfield Pet Hospital, which provides opportunities for kids and families to learn about the fundamentals of responsible pet ownership. One result of this collaboration is an enrichment guide for cats, produced by zoo and Banfield experts in 2016 and recently updated. "Although cats at home may not get the meatballs keepers feed to Zawadi, Kya and the rest of the pride, they share many of the same needs, from enrichment to veterinary care," says Dr. Daniel Aja, chief medical officer at Banfield. 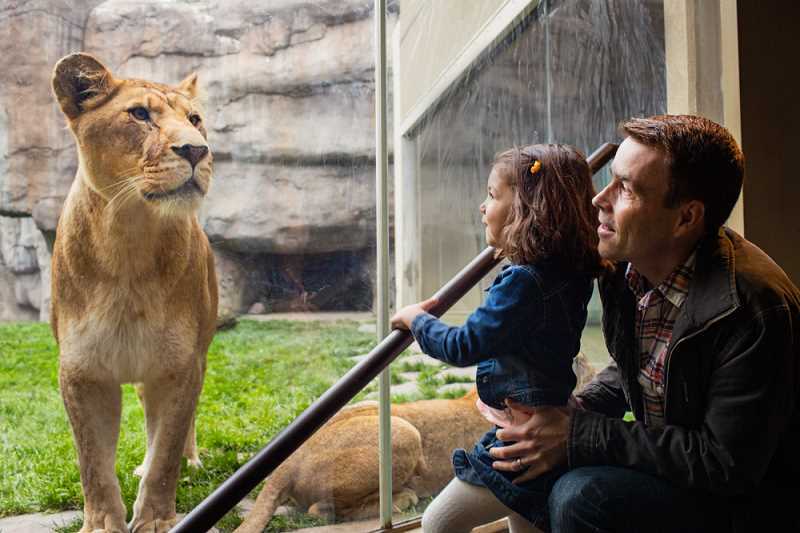 "We hope our partnership with the Oregon Zoo inspires visitors to take tips from the lions straight to their living room." Big Cat Care runs every Saturday through May 26 and then on Saturdays and Sundays from May 26 to June 3. Daily talks begin June 9 and run through the summer season. Talks take place at 11 a.m. at the Big Cat Care stage in the zoo's Predators of the Serengeti habitat. Committed to conservation, the zoo is currently working to save endangered California condors, Oregon silverspot and Taylor's checkerspot butterflies, Western pond turtles and Oregon spotted frogs. Other projects focused on saving animals from extinction include studies on polar bears, orangutans and cheetahs. The zoo opens at 9:30 a.m. daily and is located five minutes from downtown Portland, just off Highway 26. The zoo is accessible by MAX light rail line. Visitors who travel to the zoo via MAX receive $1.50 off zoo admission. Call TriMet Customer Service at 503-238-7433 or visit trimet.org for fare and route information. Founded in Portland in 1955, Banfield Pet Hospital is the largest general veterinary practice in the world. In 2007, Banfield joined the Mars Inc. family of businesses, and today has more than 1,000 hospitals across the United States and Puerto Rico, including one located at 131 N. State St., suite 131a in Lake Oswego. Call 503-635-1240 for more information.